Excellent articulation and balance with well-rounded high end. 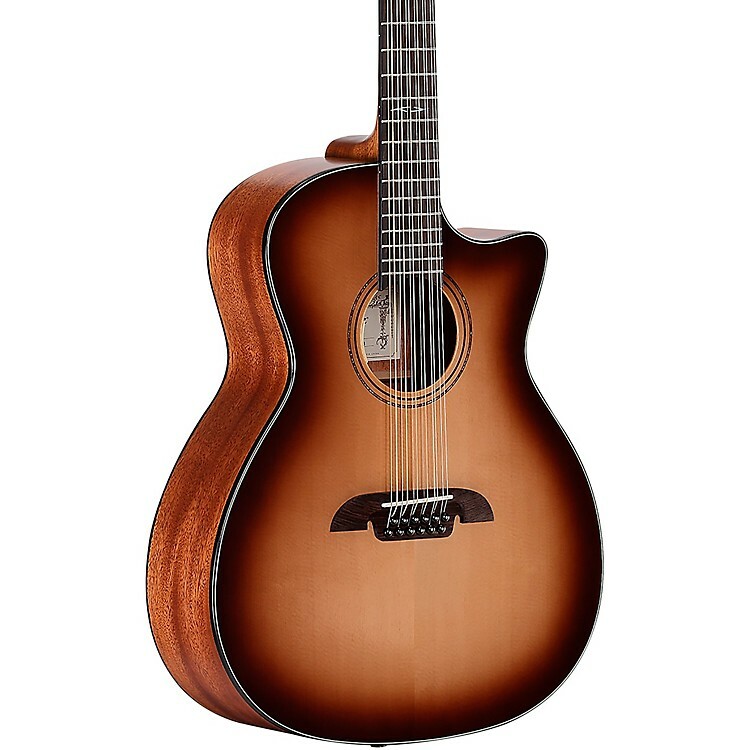 The AG610CE-12SHB is a stunning 12-string Grand Auditorium displaying Alvarez’s renowned high gloss, fine finish over a solid North American Sitka spruce top. The flawless semi-gloss back and sides allow the guitar to resonate and the same finish applied to the neck makes for a great feeling instrument that is smooth and easy to play. Tonally the AG610CE-12SHB has that Grand Auditorium articulation and balance, which is transformed into a shimmering wall of sound when strummed. 12-strings deliver that amazing upper frequency, almost chorus effect of chimes and this guitar delivers the classic 12-string sound perfectly. It’s fitted with the discrete, but lively, SYS100 pickup and preamp, located in the end pin and controlled by a smartly designed soundhole console offering volume and tone controls. Overall the AG610CE-12SHB is a beautiful, articulate GA suitable for anyone looking for the chiming sound of a well-made 12-string. After 50 years of making guitars, continual improvement through the use of emerging technologies, processes, and materials is still at the heart of Alvarez's culture. Alvarez guitars are constructed correctly in every sense, from raw material preparation to construction and manufacturing processes. Tonewoods are carefully cured; components such as neck blocks and wood joints are carefully designed. The painting, sanding and polishing techniques used are continually researched and developed, and the tone is impeccably crafted and married to a stable, consistent and lively sound box. This caring approach to development comes from one simple goal: to deliver the best guitars in the market at every price point, instruments that are truly amazing value and offer a fantastic player experience. Alvarez believes their multi-award-winning Artist Series is one of the finest solid top guitar lines in the world today and demonstrates our commitment to design. The term “solid top” refers to the soundboard being made of solid wood, rather than being laminated. However, just because the top is solid, it does not necessarily mean the sound automatically benefits from this feature. The tone of the instrument only improves significantly when the whole guitar is built correctly to optimize the energy a solid soundboard can generate. Artist Series guitars are built to do exactly this. Each model is designed to get the best out if its components, and for them to work together to produce balance, lively projection and great response. These components include Alvarez's FST2 bracing system, bi-level rosewood bridge, real bone nut and saddle, quality tonewoods and thin finish. FST2 is a forward shifted X brace design. this means the axis of the X is closer to the sound hole and therefore creates a larger soundboard area allowing for more energy and vibration to be harnessed. Both the X braces and asymmetric tone bars are carefully scalloped. The scalloping design was the result of years of continual development in their Yairi workshops. The Artist Series sound and personality is open and powerful. FST2 also creates very good balance so both the treble and bass registers are clearly present and balanced in relation to each other. Artist Series feel right and are exciting to play; no matter if you are strumming hard or picking lightly, the guitar will do what you ask of it. All tops are selected by the Alvarez team and graded independently of their suppliers. If it isn't worthy, they won’t use it. Along with a more angled headstock, the bi-level bridge increases string tension by making the break angle of the strings from the saddle to the top more acute. Improved string tension adds to the sound, feel and response, which are also heightened by the use of real bone nuts and saddles. Like what you see? Wait til you hear it. Order today.